The Answer: SloanTec™ Hydrophobic Antimicrobial Glaze. Fixtures with SloanTec™ Glaze can stand up to the harsh demands of high-traffic commercial environments. 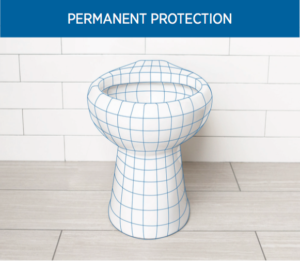 The glaze will also lengthen the lifespan of commercial fixtures like toilets, sinks, and urinals, and help keep fixtures hygienic with less maintenance required. What Is SLOANTec Glaze™ and How Is It Applied? SloanTec™ Glaze is a liquid and oil repellent coating that can be specified to any vitreous china Sloan fixture. This includes all sinks, toilets, and urinals. SloanTec™ Glaze repels liquids, resists the adhesion of solid waste and it also inhibits the growth of germs and bacteria. This makes cleaning fixtures with this glaze easier while keeping the fixtures cleaner for a longer period of time. Read on to see how SloanTec™ Glaze holds up to competitors’ antimicrobial sink and antimicrobial toilet glazes. 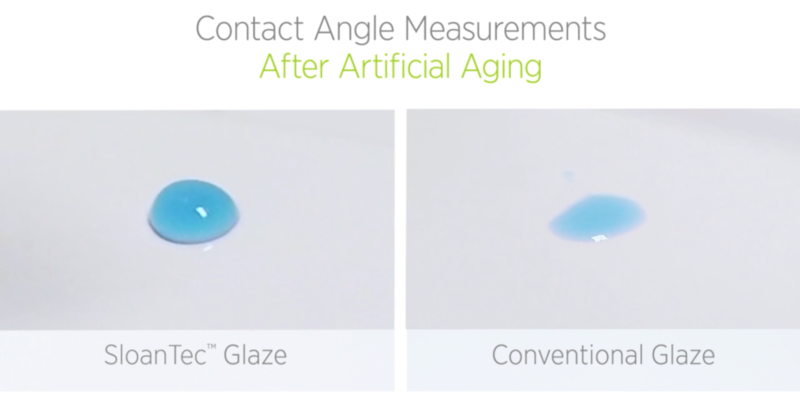 Sloan conducted a series of tests to artificially age the surface of fixtures with SloanTec™ Glaze versus Fixtures without SloanTec™ Glaze. In the test, sample surfaces were exposed to a variety of harsh chemicals like hydrochloric acid and sulfuric acids, both of which are found in toilet bowl cleaners and commercial brand cleaners. The sample surfaces where were exposed to these chemicals at 140 degrees Fahrenheit for two days. After that they each went through 5,000 cycles of abrasive scrubbing. 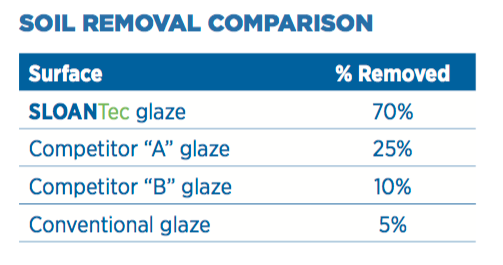 The image below illustrates how well SloanTec™ Glazed fixtures held up after the test, performing at least 45% better than either competitor glaze and 65% better than conventional glaze. SloanTec™ Hydrophobic Antimicrobial Glaze can be added onto any Sloan vitreous china fixture. As a Master Distributor for Sloan, Equiparts can supply you with the glaze on any china unit created by Sloan. You can view the most popular Sloan toilets and urinals online, or give us a call to place your order. When placing your order, tell us that you want to specify SloanTec™, and we will supply you with a price quote and help you make your commercial fixtures more hygienic. Phone hours are Monday-Friday 7:30AM-5:00 PM EST. Watch Sloan’s video about SloanTec™ to learn more about it and see the glaze in action.